Laminated flat pressboard black/white. Material: KF board, laminated black and white, Width: 80 cm, Height: 60 cm, Depth: 9.5 cm. 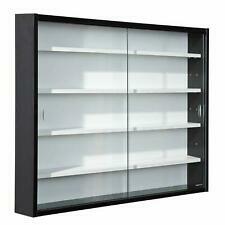 Modern Wall Display Cabinet. LADDERAX Teak Retro Record Cabinet. LADDERAX Teak Retro Record Cabinet. Great Piece In Good Condition. Measures 89.5cm Wide x 40.5cm Deep x 40cm High. In Very Good Condition With Some Marks On The Side. No Key Or Brackets. For Collection Please But May Be Able To Deliver Locally, We Are In Bristol BS16. Light wood veneer with 6 colourful canvas drawers. Storage cabinet. On wheels so can be moved around easily. 1950’s / 1960's Retro Vintage Kitchen And Sink Unit By Elizabeth - Ann 9ft 2. Eggshell Blue There is also two wall cupboards if interested that go with it. Condition is Used. Collection only. Thanks for looking. Condition is Used. Base plinth is lose on the side.H 1m 21cm. W 80cm and D 43.5cm. Collect from TA7 9HY. 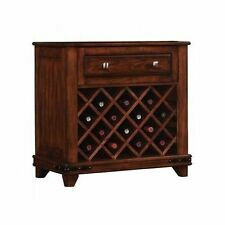 The Nebraska modern oak 2 door 2 drawer mini sideboard is an affordable item of modern furniture. This mini oak sideboard is made to a high standard using a combination of oak and oak veneers. 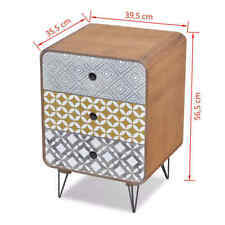 Total Cupboard Size - W61cm x H39cm x D28cm. Mahogony drinks cabinet with glass shelves and drink preparation tray. Mahogony drinks cabinet with glass shelves and drink preparation tray.. Condition is Used. Glass shelves easily removed for cleaning and transportation. Glass shelf that 'pulls out' for drink preparation. Two drawers very useful for accessories. Fair to good condition - some marks, please look at pictures carefully. Selling as I now want lighter coloured furniture. 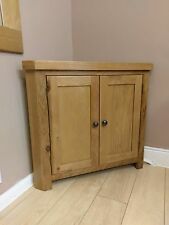 Large wooden cupboard. Condition is Used. Collection in person only. Sideboard, TV Unit, Cabinet. Heals Cherry wood veneer. Very good quality as is expected from Heals. The Cherry wood veener runs through on the inside and back as well. A slightly deeper scratch in the interior of the cabinet. Cream Wood Cabinet With 10 wicker baskets of various sizes . Condition is Used. Collection in person only. The top of the cabinet and frame is a cream wood veneer. Sizes are: 101(L), 37 (D) & 75 (H). Mango Wood Veneer Cabinet from Next, in perfect condition, unmarked. Was brought form the bathroom section, however could be used in any room. Has 3 shelves which include 2 rattan baskets, these are slightly worn. 4 shelves inc base of unit. 45cms deep 178cms high 100cms wide. Good condition just general wear marks, nothing major. Small nick on top corner. 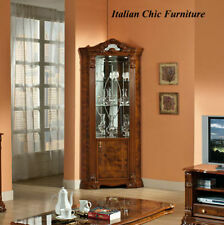 Large wooden sideboard cabinet with drawera. Condition is Used. Pick-up only from SW1 central London. Condition is Used. Collection in person only. COLLECTION ONLY, SE22 9PN (East Dulwich). Top half of sideboard in very good condition. Collection in person only. Wood Veneered Cabinet. Condition is Used. This solid wood Two Drawer Two Cupboard Door Cabinet is in nice condition with inlaid veneer pattern and lockable doors. It is collection only from Blackburn, Lancashire due to its size. Spa Under Sink Storage Cabinet. Free Standing Spa Inspired Storage Unit Finished In Beautiful Light Oak Effect. Sturdy Unit Which Is Easy To Assemble. Storage Unit With Ample Space With Easy To Clean Surfaces. 12 photos showing all angles, so scroll through to get a good idea of this lovely object. Collection in person only from York, YO23 1HG. Made of characterful oak and oak veneers. As the UK's number one heart charity, the cutting edge research we fund has already made a big difference to people's lives. Every penny you spend or donate takes us closer to beating heart disease for good. Condition is Used. Very good condition except for the mark you can see in picture. 122cm across. With 3 lights (electric). New listingBeaver & Tapley 33 Modular Furniture in Burgundy Oak. dark wood display cabinet. Condition is Used. Buyer collects. Has light to illuminate contents. 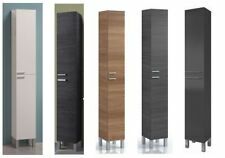 Ikea Besta storage unit, No doors. Double Ikea Besta storage unit, few marks from use. 5 shelves per side 120 wide x 193 tall x 41.5 deep Doors not included in listing. Disassembled ready to go. Collection only, no returns, UK bidders only please. Located in Winchester but i move around south so potential delivery. THERE IS A CRACK IN THE REAR PANEL AS SHOWN IN PHOTO. THE SMALL GLASS SLIDING DOOR IS MISSING SO THAT IS NOW AN OPEN SHELF. This is for 3 pieces of furniture - A Lit Glass Display Cabinet, A Drinks Cabinet & A TV stand with Drawer and removable Shelves. The 3 pieces cost over £1000 when new a few years ago. The display cabinet & the drinks cabinet are both in excellent condition. 1950’s / 1960's Retro Vintage Kitchen utility unit. Condition is used. Part of the base needs repair other than that its a solid piece. 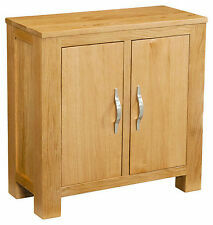 Compact Bathroom Cabinet Hallway Storage Unit in Light Oak. Free Standing Storage Unit Finished In Beautiful Light Oak Effect. Sturdy Unit Which Is Easy To Assemble. Compact Slimline Storage Unit With Ample Space With Easy To Clean Surfaces. 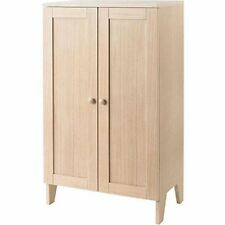 Tallboy Bathroom Cabinet Hallway Storage Unit in Light Oak. Free Standing Storage Unit Finished In Beautiful Light Oak Effect. Sturdy Unit Which Is Easy To Assemble. Compact Slimline Storage Unit With Ample Space With Easy To Clean Surfaces. Gold Inset Pulls on Two Original Glass Sliding Doors. Miller Mahogany Veneer Bathroom Cabinet with two sliding mirror doors. Collection only from Knebworth, Herts due to glass and mirror content.